The Elite Team after their first road session of 12 miles. “When I used to see those silly looking people at Cooper River Park in those tight fitting uniforms all hunched over their bikes I never in all my life imagined I would become one of them - I thought they looked creepy. After three sessions of classroom orientation I’m going to get on the road today. I’m miles away from home in this place called the Jersey Pines and there isn’t much that looks familiar. The whole idea of riding a bike as part of a team sounds as silly as those spandex suits. 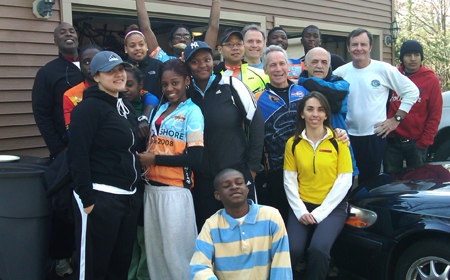 My classmates and I are going to become a team, the UrbanPromise Academy (UPA) Elite Cyclers. Eleven of us have signed on to ride in the 50 mile Pedal for Promise fund raiser set for May 7th. Sometimes you don’t have to physically cross a road to cross a road—you cross with your heart. In early December Ms. Baker—the principal of our elementary school—told a story about a 12 year old boy in Malawi, Africa named Harold. Harold attends an AfterSchool program in Lilongwe that UrbanPromise started a few years ago. Ms. Baker shared how 12 year old Harold begins each day early in the morning. He puts on his few tattered clothes, gathers his water buckets and walks down a dirt road to a small well. With rapt attention from the children, Ms. Baker continued to describe how Harold, then waters and tends to his grandfather’s small garden plot of land. After finishing the hoeing, Harold leaves his village to collect firewood for cooking. Returning with his small bundle of sticks, he cooks breakfast for his four siblings, cleans up and begins his walk to school. By the time Ms. Baker finished telling how it cost 82 cents a day to feed Harold and his brothers and sisters, the children were deeply moved and some wiped tears. The next day, Ms. Baker’s students showed up with pocket’s full of change. They plunked their pennies and dimes into their bottles. Later that morning one parent stopped Ms. Baker in the hall and asked: “Who’s this Harold person?” Before Ms. Baker could respond the parent added, “All my son wants to do is help some boy named Harold—all my spare change is disappearing,” she said with pretend annoyance. 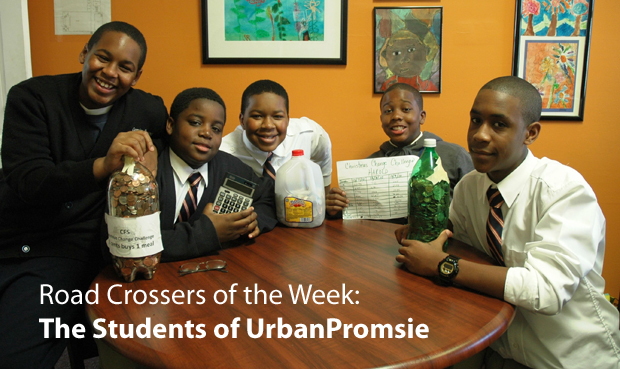 None of our UrbanPromise teachers and staff could have imagined what would happen next. The seventh graders started to compete with the sixth graders and began bragging about who had collected the most change for Harold. Other classes jumped in on the action. The children started counting their coins each morning, posting their new totals on chalk boards. Everyone loved the competition. In the end our children raised over $600 dollars—more than the average Malawian makes in a year! Many people picture inner city kids and teens as cold, tough, and indifferent. Many also believe that children in Camden are too poor to help others. The children of UrbanPromise let their hearts cross a road. This is how road crossing often begins—it begins by allowing our hearts to feel the pain of another person. And when our children felt Harold’s pain, they were compelled to act. Indifference was not an option. This is what happens when we dare to cross roads. In January I had the chance to travel to Malawi to visit Harold. I visited his hut. I listened to his story. I got to see his school. Most importantly I was able to report back, first hand, to the children of UrbanPromise how their generosity made a difference for Harold. But Harold is not the only person changed through this road crossing event. A group of children from Camden now have a friend in Malawi. They have become bigger people. Their hearts and world is larger. No longer do our students only see their own needs. This is the fruit of crossing the road. What does a sixty-one year old grandmother, living and working in the city of Camden, have in common with a 20 year old sophomore from The College of William and Mary? Some people might think—not much. This past week Kelly Ann, a History and Secondary Education major was partnered with Tina Thomas—a teacher’s assistant at our CamdenForward School—to provide supervision for our Kindergarten Class. Prior to last Monday, Kelly Ann and Ms. Thomas had never met. Their worlds are completely different. Kelly Ann spends the bulk of each day taking lecture notes, going to InterVarsity Christian Fellowship Meetings, and roaming the bucolic grounds of her campus. In coming weeks, Kelly will to wade through the angst of deciding on whether she should do a summer internship in educational research, travel the globe, or get a part-time job to raise a little extra cash. Ms. Thomas arrives at the CamdenForward School early in the morning and is greeted by wide-eyed, energetic, demanding 5 year olds. It’s tiring work. On lunch break Ms. Thomas ponders how to stretch her pay check to cover her bills. Different women. Different stories. Different vocations. Radically different lives. But this past week Kelly Ann and Ms. Thomas crossed a road. Two strangers became friends. So Kelly Ann and Ms. Thomas will go their different ways—perhaps never seeing each other again. Yet they separate as different people—different because they have traces of the “other” in their minds and hearts. We need your help! Our AfterSchool Programs are in urgent need of volunteers! Cut backs in the Camden police force coupled with inferior public schools make this a critical time for the future of Camden's hard working youth. We are in need of people willing to help tutor children from grades K-8. Our AfterSchool Program kids, who mostly attend underperforming Camden schools, would thrive with the opportunity to receive one on one tutoring from an individual who is willing to come once a month, once a week or even daily! All you need is the ability to love coupled with a desire to make a difference and you will help a child be a success! Our youth are in need of people to help with: math and language arts homework, practice multiplication facts with flash cards, reading partners and much more. We would love the opportunity to introduce you to our amazing program and kids. Angelina (Lu Lu), Does a really great job with reading and writing but when it comes to her math skills she quickly loses confidence. Jackie has a wildly creative imagination but has dificulty articulating it in her school work. Joshua, Ozzy and Xavier: all three boys are struggling with their reading skills and beginning to fall through the cracks in school. Bring a snack for 40 kids and teens. Cook a big pot of soup, spaghetti, fruit trays, vegetable and dip trays, pizza, etc. We are always looking for people to help with homework, reading partners, multiplication or other math flash card/drills. Consider leading a craft project for the day. Click here for other volunteer opportunites at UrbanPromise. Do you have safety concerns? Please give Susan Wilhelm, our volunteer coordinator a call or email to discuss your concerns. Susan will give you more information about volunteer opportunities, tell you more about the neighborhoods our programs are located in and much more. Potential volunteers are encouraged to schedule a time to come visit the program they are interested in during program hours. Potential volunteers would meet at our main campus (click here for directions) with Susan and then travel together to the program you are interested in working with. You will have the opportunity to meet the program director and youth. Don’t miss out on this incredible opportunity to serve. Call today! From September – January of this year, UPA juniors and seniors participated in a course on leadership, called “Servant Leadership”. During the 6-month course, students explored servant leader attributes; techniques; and examples. They kept journals with their reflections and attempts to display servant-leadership, and they role played characteristics, such as empathy. The culmination of the course was to complete a leadership project that combined at least 4 servant-leader attributes. Projects included the design of a community mural; a white paper to the Governor’s office on Education Reform; a community mapping survey; and leading a school assembly for K-8th graders. The Holman family generously allowed the 20 students to present their final projects in their BMW dealership conference room. The setting provided a high standard and Donald Trump-like setting for the students….but now all of our students want to own a BMW in the future! 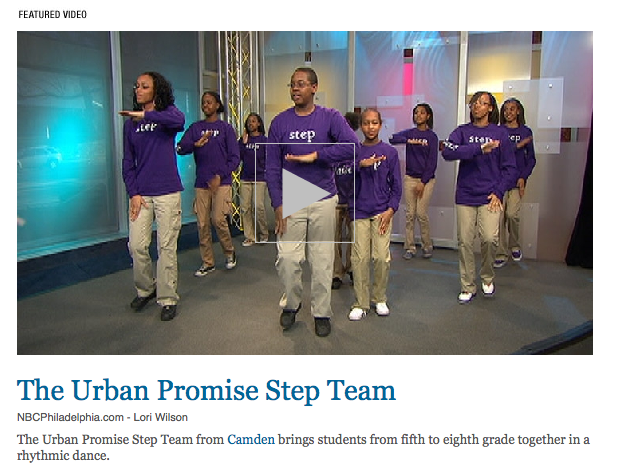 On Saturday, February 5, sixteen students, parents and staff from the UrbanPromise were treated to a morning concert at the Kimmel Center featuring the Philadelphia Orchestra performing a Children’s Concert. This was made possible through the generosity of the American Association of University Women. They attended a pre-concert educational event which explored the musical aspects of tempo and dynamics. The children listened attentively as these ideas were presented in a fun and interactive way. The concert by the Fabulous Philadelphians featured narrator Jamie Bernstein, daughter of composer Leonard Bernstein. With Ms. Bernstein, the students further explored tempo and dynamics with the entire orchestra performing works of Tchaikovsky, Stravinsky and Mahler.